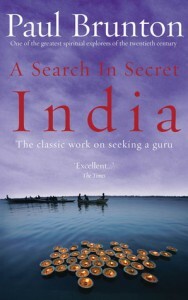 Bruton has recorded his experiences while searching for a Guru (Holy Teacher) who can initiate him into Yoga. Its a marvelous account of how he traveled the whole country as a critical seeker and found some great Yogi’s and spiritual teachers but could not accept any of them as his Guru until he find Raman Maharshi. My own Guru Pt. Sriram Sharma Acharya, who is the founder of All World Gayatri Parivar used to say, “when you are going out in the market to but vegetables etc you check thoroughly for quality, so why can’t you do the same when you go in search of a Guru“. The best part I like about Brunton is the critical questions he asked various spiritual leaders in order to test whether they are actually spiritual or merely taking advantage of the people in the name of religion. This is a great book which presents multiple faces of India at those times and I would highly recommend it to all spiritual seekers. This entry was posted in Book Reviews and tagged book-reviews, spirituality-and-religion. Bookmark the permalink.